The Gotcha SprayerTM Pro is an adaptor that enables you to attach and trigger virtually any type of aerosol can from the end of an extension pole. Now the same Gotcha SprayerTM Pro will work with our Powder Duster as well. Dust or Spray from the end of an extension pole. 1) Can also be used with our Powder Duster. 3) Comes with a diamond braided cord, instead of a twisted string. If you don't need these additional features, the regular Gotcha Sprayer adaptor will work fine. You Can Purchase The Gotcha Sprayer Pro At Our Online Store, Pest Control Buzz. If you have your own extension pole, the Gotcha Sprayer is the perfect way to spray aerosol cans and our powder duster. Simply insert a can of aerosol spray or our powder duster, attach the Gotcha Sprayer to an extension pole (each sold separately) and you're ready to spray or dust. The Gotcha Sprayer will work with any standard aerosol spray can. No need to use a stepladder to reach those high areas. The Gotcha Sprayer is a better way to spray. Professionals: Use the Gotcha Sprayer for spraying or dusting wasp nests, hornet nests, and yellow jacket nests. Works with any aerosol insecticide and our powder duster. The Gotcha Sprayer can be angled to spray or dust those hard-to-reach areas. It's worth the price to not have to pull out the ladder or climb up on the roof to reach those high areas. Read the label on the wasp and hornet sprays: some say they damage siding, shingles, and/or shrubs. Position the Gotcha Sprayer right in front of the target. No more messy overspray on the house or windows. Minimize the overspray getting on your face and in your eyes. The Gotcha Sprayer can attach to extension poles up to 24ft long to reach those high eaves. No more climbing on ladders to reach those high peaks. It can be angled to reach under decks without having to crawl in the dirt or getting trapped in tight spaces. Spray wasp nests, hornet nests, and yellow jacket nests with any standard wasp and hornet spray. It can also be used with aerosol dusters for removing carpenter bees. Simply secure the can to the Gotcha Sprayer and extend the extension pole and spray. For removing wasp nests or removing hornet nests, check out our complete combination packages for spraying and scraping off the nests. Use the Gotcha Sprayer to spray wasp and hornet spray around bleachers, picnic areas, concession stands, public restrooms, boat docks, barns and out buildings. Position the spray directly in front of the target area and minimize the amount of spray that gets on the surrounding areas and into the environment. For removing wasp nests or removing hornet nests, check out the wasp nest scraper below. The Gotcha Sprayer is great for testing and certifying commercial smoke detectors. Simply secure a can of Smoke Detector Tester to the Gotcha Sprayer, attach an extension pole and you're ready to go. The Gotcha Sprayer works with extension poles up to 24ft long. Easily reach 3-story lobby smoke detectors. There is nothing easier for testing smoke alarms. The Gotcha Sprayer is designed for smoke detector testing. 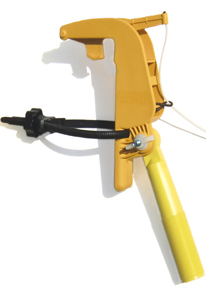 Use the Gotcha Sprayer for spraying pruning compound on freshly cut limbs and branches. Reduce the risk of insect infestation. 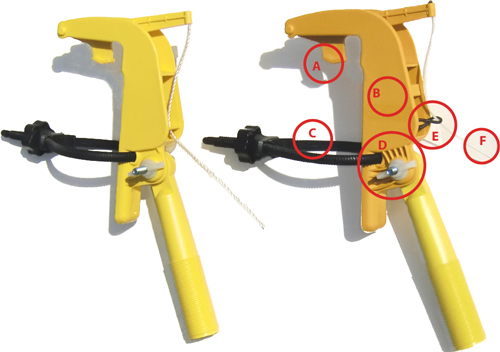 Use the Gotcha Sprayer for spray painting tree branches and marking the ones that need to be cut. The Gotcha Sprayer connector only works with extension poles with a standard American threaded tip. Please email us for questions regarding European orders.